Is the specified price valid for one person? Yes, it is valid for one person! How long before the flight shall I book the tickets? It is advisable to book the flight about 14 days in advance. Can I determine the air route? The air route for the individual products is fixed. If you have a request for a charter flight, please contact us by phone. What happens, if the flight gets canceled because of the weather conditions? You will get informed by phone and in agreement with you, you will be booked on another appointment to the known flight times by your choice or you will get a voucher with which you can book a flight again. Am I able to choose my own seat in the helicopter? It is possible to book the seat right next to the pilot for additional 45,00 Euro. The remaining disposition of seating is the decision of the pilot. What is the difference between Standard and Premium Service? The Premium Service includes the “Skip the Line” service. This means that we accompany you to the security check so that you do not have to queue the line. Because of that it is adequate to be at the airport one hour before takeoff instead of two hours. In addition you get a welcome drink! The Premium Service is available for additional 26,00 Euro for each person! Children have their own seat in the helicopter and because of that they do not get a discount. How many passengers can join the flight? Up to five passengers with the maximum weight of 410 kg can join the flight! 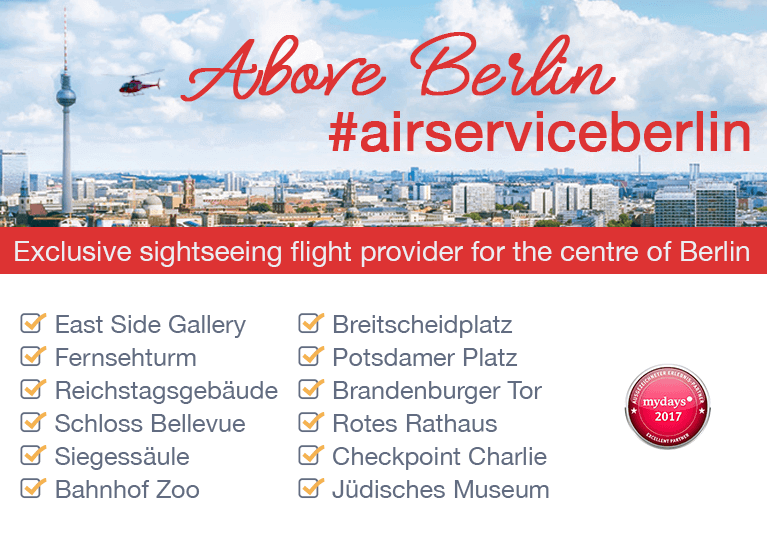 You can book the flight via our website: www.air-service- berlin.de! Can wheelchair users join the flight? Yes, we provide this service. Please contact us by phone before you are going to book the flight. This special service has to be registered at the airport and is liable to pay costs. The invoice is charged by the airport. See our terms and conditions.